You are sitting up straight, and don’t know that in less than a minute you are going to die. The narrator of “The Future Perfect” is riding the bus, listening to the Beatles on an iPod, when a tragic accident occurs on the street outside. Paolo Zardi doesn’t tell us which album it is, but perhaps we can speculate that it is Sgt. Pepper. 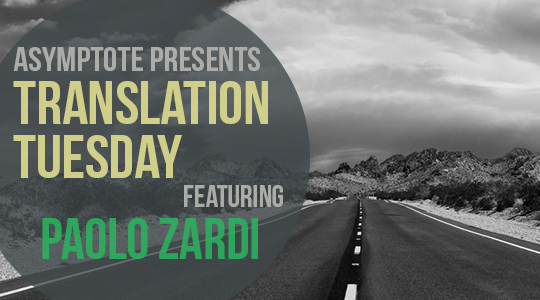 As a shattering portrait of parental loss and a terrifying vision of the randomness and finality of death, Zardi’s story recalls the songs “She’s Leaving Home” and “A Day in the Life,” respectively. Like those songs, the reverberations of “The Future Perfect” stay with us long after the final line. I’m sitting on a plastic chair on the number 7 bus, on Corso Stati Uniti, heading towards the station, laptop case in hand, and a sense of satisfaction for the great deal I just closed. You are riding a scooter, an Aprilia SR, with a black leg cover over your legs, a bunny-eared helmet on your head, and a windshield to protect you from the rain. You are sitting up straight, a common female stance, and don’t know that in less than a minute you are going to die. Opposite me, there is a woman who is the carbon copy of a girl who was in elementary school with me, but ten years older; you, in the meantime, drive up alongside the huge window where I’m watching Padua’s drenched industrial area flash by—I can also see a Seat León waiting to exit a side road, five hundred meters ahead of us—and I smile when I see the huge bright “Serramenti Cacco” sign; then, I look down at you, but the visor of your helmet is dark, and I can’t see the lines of your face. You continue driving in your lane, next to us, under a trickle of rain, while on the bus a black kid offers his seat to a man who had no idea he was that old. We will pass you soon, and you, trailing behind us, will crash into the front of a car that will not have yielded the right-of-way; we will only hear the muffled sound of sheet metal buckling, and we will ask ourselves what the noise was; someone will say it was two cars crashing; someone else will add, in the dialect of Padua, “That was some crash!” and then we will all go back to reading our books, to listening to the Beatles on our iPods, to asking ourselves why we hadn’t noticed we had aged. While your mother is preparing the pasta for dinner, a doctor will be trying to reanimate you, pressing his hands down on your chest 103 times a minute, the time it takes to cook the Barilla farfalle noodles; they will be throwing in the towel just as your mother is draining the pasta and is starting to ask herself why you are so late. At eight thirty, sweaty-palmed, she will call you on your cell phone, and on the other end a man will sit down and wait for it to ring just once more, just one more time before working up the courage to answer and explain to the person who brought you into this world what has happened to you; and on this side of the world your mother will slip to the ground and will scream, without understanding, “Oh God, oh my God!” Your father will get up off his armchair, where he had started watching the news of Obama’s victory on channel 2 and, heavy-hearted, he will go to the kitchen; and when he sees his wife sitting on the floor, he will understand everything, immediately; then he will kneel next to the woman he has always loved, and he will hold her as if she were made of fine glass, and, incredulous, they will cry, together; your mother will remember the day she gave birth to you and your father the first time you told him you loved him. Then, in time, your room will become a shrine and your things small relics; your mother will spend her next years listening to your CDs, stuck forever in 2009, hugging the first teddy bear she ever bought for you; your father will slip into a silence that is more and more dismal. But in the meantime, we, the passengers on the bus, will have already arrived home: when your mother was dialing the phone, I had already eaten dinner; when she slipped to the floor, I had finished brushing my teeth; when your parents were driving to the hospital, accompanied only by the sound of their sobs, I was finishing the book on my night stand. And while they were identifying your face, disfigured by death, I had just closed my eyes, thanking the Lord for such a beautiful day.